I was so excited to receive my first Nest candle to review from Candles Off Main. The scent… Ocean Mist & Sea Salt. This is such a popular luxury brand and one I haven’t had the pleasure of reviewing yet so you can imagine my excitement to finally review one for Candlefind. I decided to start small with a 2oz votive… should this candle turn out to be incredible, which I’m thinking it will be… I can always purchase the larger candle next time. That’s the crux with luxury candles… the price, but – so worth it when you find an amazing candle. Refreshing and clean, the gentle essence of ocean mist is peppered with hints of sea salt, crisp white tea and luscious coconut. First impression… the wax indeed smelled fresh and I even want to say masculine. I couldn’t really detect sea salt or coconut by simply smelling it cold but I’m crossing my fingers those two notes come to life once the candle is burning. What I did smell was crisp white tea and a fresh component that gave it that masculine vibe I was detecting. I loved it but then I’ve always been partial to masculine scents. Time to light my candle!! Because of the size, I stuck to a small powder room to burn this votive in. Once lit, it didn’t take long to start noticing the aroma and oh my goodness was it amazing. 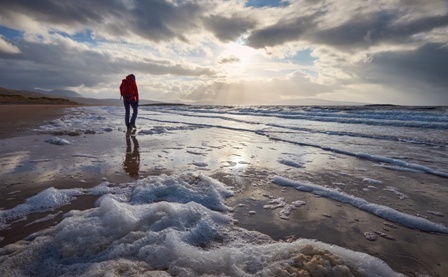 It’s interesting, there are so many ocean (ozone) type scents on the market but I’ve never really cared for any of them – mainly because they all seem to take on a harsh quality that reminds me of detergent. Ocean Mist & Sea Salt was the complete opposite and I absolutely loved it. There was zero harshness to this fragrance which I was ecstatic over. Ocean Mist & Sea Salt from Nest smelled like a clean and soothing spa type fragrance but with an added masculine vibe. The overall scent was sweet, fresh and unisex all at same time. Definitely my kind of fragrance. It’s the kind of aroma that freshens up your home and puts a smile on your face every time you walk into the room. And that was me the entire time I had this candle burning… I found myself taking deep breaths in appreciation each time I entered my power room. Strength – on a scale of 1 to 10, I would rate this little votive a 9 in a very small room. I was really surprised at the scent throw it gave off for its size. It filled my little bathroom within minutes of lighting it and even spilled outside the room into my hallway. It was a strong little votive so I can only imagine the strength the larger candle will give off. I loved Ocean Mist & Sea Salt and I can definitely see myself purchasing the larger size down the road. This fragrance had so many qualities to it that I loved and know would appeal to the pickiest of candle lovers. It was clean and fresh with a spa-like edge that created a nice and soothing aroma. I really enjoyed it and can’t wait to try the larger size now. This little votive gets 5 stars across the board. Presentation was gorgeous, authenticity was spot on, it burned perfect and the strength was excellent. Perfect experience all around. 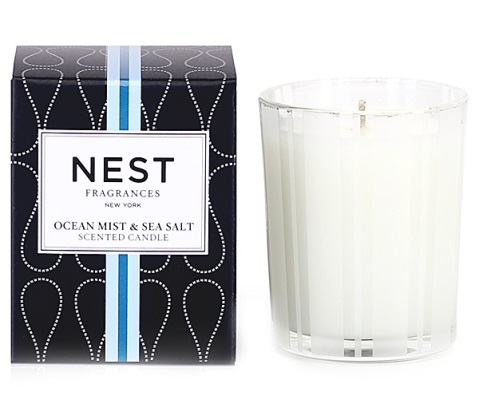 Have you tried Ocean Mist & Sea Salt from Nest? Review it with us. In the comment section below, review and star rate your experience… it’s easy!